Popular festivals in Mexico are directly related to the country's cultural wealth. The United Mexican States is eleventh worldwide in terms of population. Its rich millenarian culture, together with its linguistic diversity, give it a unique and exceptional character. Festivals in Mexico have, mostly, something to do with indigenous traditions, but also with Christian customs. In one way or another, Mexicans have a very varied calendar of events. In January the Day of the Epiphany is celebrated in Mexico, which coincides with the arrival of the Magi on 6th January. As in Catholic countries, this celebration is accompanied by the Roscón de Reyes, and gifts for the little ones. One of the popular festivals in Mexico which takes place during the month of February is the Candelaria festival. Every 2nd February, families gather for tamales and bring a little Jesus Christ figurine to the church for their blessing. Also during the month of February, a non-religious festival takes place: the Carnival of Veracruz. Dating back to the seventeenth century, it is one of the most famous in South America after Rio de Janeiro. Another important event in Mexico is the Anniversary of Benito Juárez, which is celebrated on 21st March. This Mexican holiday is one of the most important in the country, because it is celebrated in honour of the birth of Benemérito de las Américas. During the month of April, Mexicans celebrate Holy Week, as do other Catholic countries around the world. Religious processions take place, and people go to church to pray and take mass. Also in April, the San Marcos Fair takes place, considered one of the most important fairs in the country. With an age of more than 180 years, this famous bullfighting fair hosts the largest cattle exhibition in all of Latin America. In May, one of the popular festivals in Mexico is celebrated commemorating its struggle for independence. In particular, it is the Anniversary of the Battle of Puebla, when the French were expelled from Mexican territory. On 24th June, among the festivals of Mexico, the Feast of San Juan Bautista is celebrated. In the parish of Coyoacán, the faithful prepare a special altar for the celebration of different masses throughout the day. Among the festivals of Mexico with a traditional character, we can attend the Guelaguetza in July. This festival, celebrated in Oaxaca, is a meeting of traditional dances, where the music and the typical cuisine of the country are the protagonists. 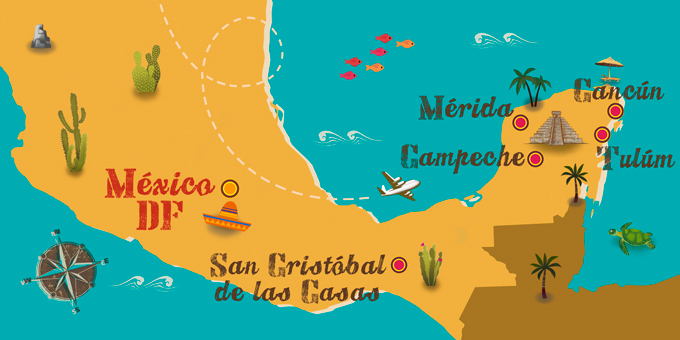 In August different popular festivals of Mexico take place throughout the country. Beginning with the harvest festivals, which take place between 14th July and 15th September in different regions, we can continue with the Lagos de Moreno Fair at the beginning of August. Other events in Mexico which are celebrated during this month are the Zacatecas Festival and the International Marimba and Flowers Fair. The Potosina National Fair, or the Medieval Festival of Fireflies, are other festivals which you can visit if you travel to Mexico in August. The Fiestas Patrias is celebrated on 15th and 16th September throughout Mexico. But is doesn't stop there, because September is a month full of popular festivals and events for Mexicans. The Tequila and Mariachi Festival and the Marquesada Festival take place at the end of the month in Ciudad Juárez and Guanajuato respectively. But if you want to experience one of the oldest Mexican festivals, don't miss the Huey Atlixcáyotl Festival in Puebla. During the month of October, if you are in Jalisco, you can attend the most important cultural festival in the country. Throughout the month, different events are held in different locations: dance, painting and music are the protagonists. The National Festival of Coffee and Huipil is one of the popular festivals in Mexico which is worth visiting. Likewise, the International Mayan Culture Festival in Mérida and the Yucatán takes place in October. And we come to November, when one of the most popular festivals in Mexico internationally is celebrated: the Calaveras Festival and the All Saints Fair. The Day of the Dead celebrations have a special place in the hearts of the Mexican people. The celebration of Oaxaca is perhaps one of the most important in the country. In addition to celebrating Christmas Eve, Mexicans also celebrate other typical Mexican festivals, such as the Piñata Fair, or the Pastorelas. The devotion to the Virgin of Guadalupe, also has its special day on 12th December, when thousands of believers take the virgin on procession. But if that were not enough, Mexico's popular festivities include more traditional events such as La Pelota Purépecha, the Dance of the Voladores, or the traditional Fiesta de los Quince años. Mexico offers all this and more, a country full of flavour, tradition and above all joy and colour.